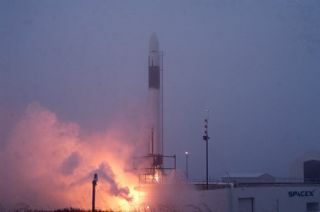 The Falcon 1 rocket, developed by SpaceX, fires its first stage engine during a test at Vandenberg Air Force Base in California. Following an on-the-pad short burst firing of their Falcon 1rocket engine last month, Space Exploration Technologies Corporation (SpaceX) is on track for amaiden flight of the privately-built booster. Assuming that there are no further delays in lofting a Titan4 classified mission from Vandenberg Air Force Base in California - now slated for a July departure- SpaceX expects to receive a Falcon 1 launch window from that spaceport for anAugust timeframe. The five second engine firing on May 27 of Falcon 1's Merlin main engine was"picture perfect," explained Elon Musk, chairman and chief executive officer of the El Segundo,California-based company in a just-issued SpaceX update. Falcon I development is essentially complete, Musk added,although SpaceX engineers will continue to do testing and retesting right up tothe day of launch from SpaceLaunch Complex 3 West at Vandenberg Air Force Base. The premierliftoff of Falcon I will carry the U.S. Defense Department's TacSat-1 satellite. For SpaceX, the rocket-for-hire business is looking good, Muskstated. TheU.S. Air Force has awarded the company a contract for Falcon I launch services.The value of that contract could be as much as $100 million, depending on howmany launch options are exercised. This is independent of a Defense AdvancedResearch Projects Agency (DARPA)/Air Force FALCON program, he added, for whichSpaceX will be conducting a launch later this year from the firm's launchcomplex in the Marshall Islands. The FALCON program--not the Falcon 1 SpaceX booster--standsfor ForceApplication and Launch from the ContinentalU.S. This military effort is aimed at showcasing technologies for affordableand responsive space lift. "There are also a number of other customer discussions thatare quite mature. It appears quite likely that we will receive one or two morelaunch contracts over the next few months," Musk said. SpaceX now has threelaunches to carry out in the next six months, he said, and considers thecompany goal of achieving an annual launch rate of five-plus in a few years asreachable. "Not yet mentioned on our manifest or in any press releaseis our classified launch business, for obvious reasons," Musk said. The rocketexecutive did not elaborate, except to say that the dollar value exceeds allunclassified business combined, excluding the U.S. Air Force $100 million contract. Also highlighted in the company update is a NASA JohnsonSpace Center (JSC) Space Act Agreement with SpaceX. "JSC is the primary NASA center for human spaceflight and,since human transportation is the primary long term goal of SpaceX, we arelikely to be doing a lot of work in partnership," Musk said. The new Space Act Agreement provides a legal framework forinterchange of personnel, information and resources, Musk explained. "Now that development of Falcon I isalmost over, we are turning our focus to Falcon 5, and one of the primarymarkets for that vehicle is resupply of the International Space Station. Assuch, we will need to work closely with JSC and other parts of NASA tounderstand the rendezvous and docking/berthing requirements," Musk said. SpaceX is undergoing "a significant transformation" thisyear, Musk said, from a company that does research and development (R&D) toone that does R&D, manufacturing and launch operations. Moreover, with the development of Falcon 5 "and a few secretprojects we have on the go," Musk said, the rocket group is also increasing thescope and scale of the R&D. "We have tripled in size from a year ago and arenow at about 130 employees," he reported. That growth includes office and manufacturing space, a300-acre test facility in Texas, as well as anoffice in Washington D.C.and launch complexes at Cape Canaveral, Vandenberg and the Marshall Islands.